Bats: Learning to Fly is the latest volume in First Second's Science Comics series, and I learned so much from it. For instance, I learned about how echolocation works, about the many types of bats all over the world, how bats fly, and how bats are more like primates than they are rodents (even though they get likened to flying mice all of the time). I also learned why some of them have such striking faces. I'd tell you about all of this info, but you should really read the book and find out. 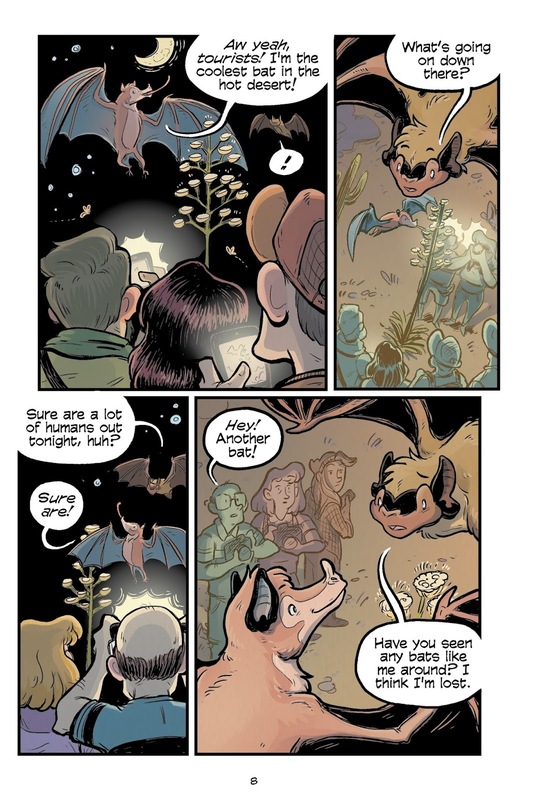 Not only is this book full of great information, it is conveyed in an interesting way through a brisk and enjoyable tale of a little brown bat who gets smacked down by a scared human and ends up being cared for by Rebecca, a veterinarian who specializes in helping bats. In her office, the bat gets to know many of the fellow bats who are also being cared for, and they are a motley bunch. Like its companions in the Science Comics series, this book also goes beyond its main narrative to teach an important aspect of science. The dinosaurs book looked at how scientific knowledge evolved over time, the coral reefs book at how scientists are also stewards of the Earth, and the volcanoes one at how scientists need to consider alternative viewpoints to make breakthroughs. In Bats, the alternative lesson is a dual one: namely not to allow preconceived notions cloud one's judgment (like the Little Brown Bat does about fellow bat-patients) and also that doing science also means taking part and getting involved (in this case when Sarah volunteers her time at a veterinarian's office). This book's creator Falynn Koch is a graduate of SCAD and this is her graphic novel debut (as far as I can tell). I was very impressed with her storytelling and how much she was able to capture with her characters' features and expressions. This book is packed with so much information, and her ability to combine it with a fun, vivid story is noteworthy. All of the reviews I have read of this book have been ringing. Johanna Draper Carlson found many positives in the book and stated that she "was impressed by how well Koch gave the various bats expression and personality while keeping them looking realistic." 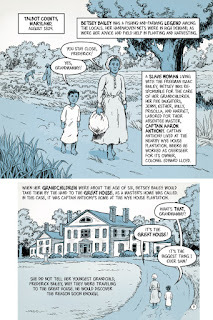 Gwen and Paul at the Comics Alternative wrote that it "will delight readers, while encouraging them to appreciate how they can play a role in scientific study." Jody Kopple called it "an excellent addition to school and classroom libraries" in her starred review for the School Library Journal. 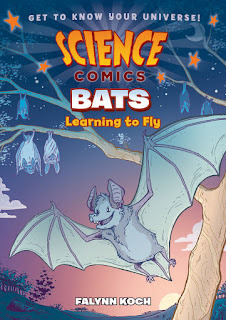 Bats: Learning to Fly was published by First Second, and they have a preview and much more available here. Both biographies begin with respective childhoods and formative experiences that would come into play later in their lives. Along the way, I learned much about each person and major players of the time period. Also, there are deftly told accounts about slavery, the Civil War, and other historical contexts. That the creators were able to chronicle so much information while spinning compelling narratives and characters is extremely impressive. 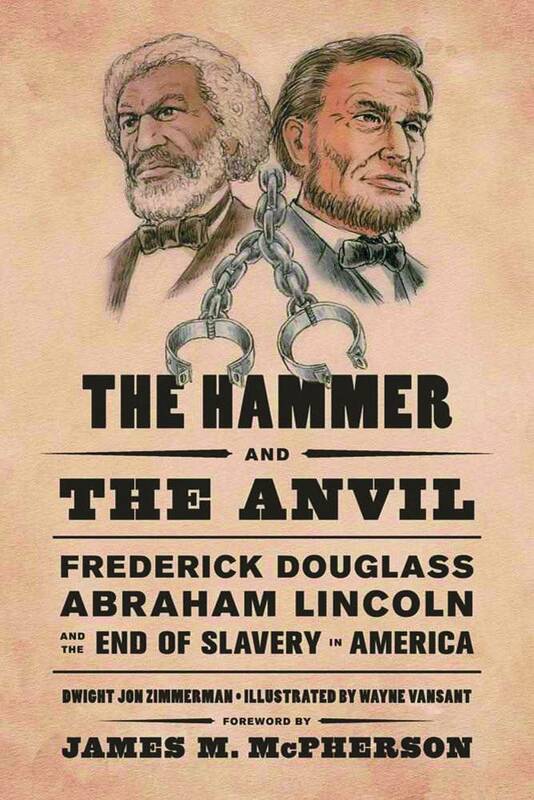 One of the features I admired most about this book is that it does not overly lionize either Douglass or Lincoln. Certainly they are shown to be impressive and important people, but they are also shown to have their own problems and human moments. 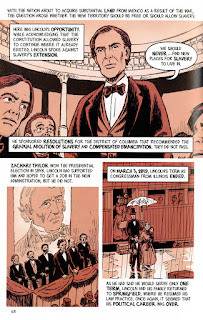 I especially appreciated how Lincoln was not simply canonized as the Great Emancipator but was shown to wrestle greatly with many social concerns and pragmatic thoughts that conflicted with his idealism. The artwork was also a huge positive about this book. There are many detailed panels that represent the time period very well. Additionally, there are multiple scenes where characters' emotions and feelings come through very powerfully. This book is both masterfully plotted and illustrated. It definitely brings history to life. 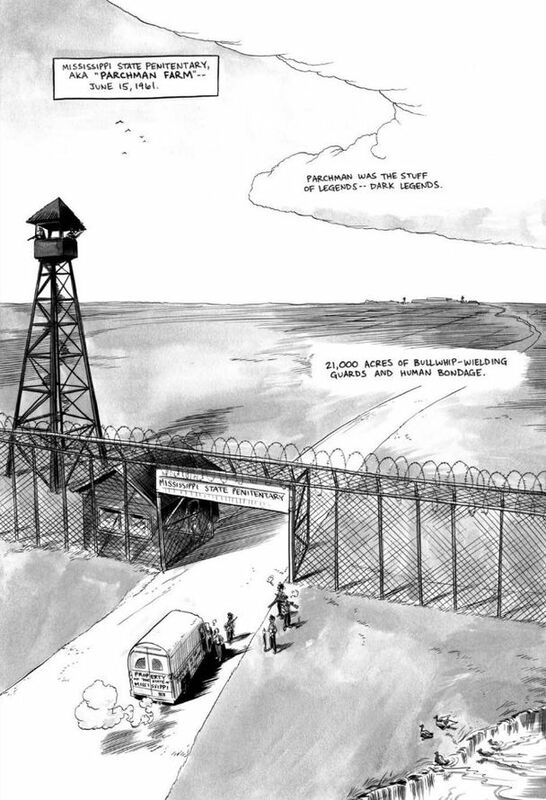 This book's creators Dwight Jon Zimmerman and Wayne Vansant also collaborated on another graphic history, The Vietnam War. Zimmerman is the author of a number of other books on military history as well as a producer of TV shows on that topic. 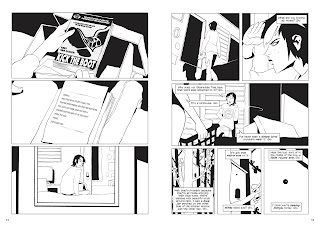 Vansant began drawing comics decades ago with Marvel Comics' Savage Tales and The 'Nam, and he has drawn a number of historically-themed graphic novels including one about the D-Day battle at Normandy. Reviews and news I have read about the book have been positive. 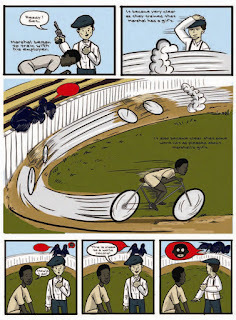 It was nominated for YALSA's 2013 Great Graphic Novels for Teens list. Hillary Brown concluded, "Anyone who doesn’t specialize in this material will learn something." 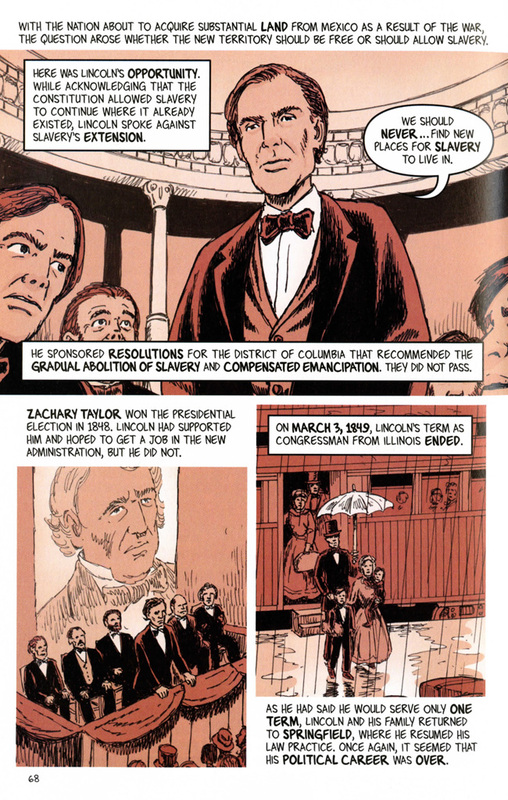 Publishers Weekly summed it up as "a compelling look at two of the most important figures in American history." Viviane Crystal called it "a superb historical fiction story." 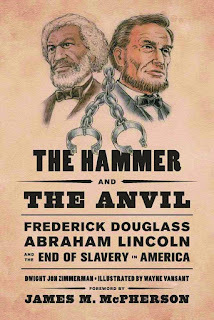 The Hammer and the Anvil was published by Hill & Wang, and there is a preview and more information available here. The mark of a great book may be just how long it sits with you after you have finished reading it. I read this book and was pretty dissatisfied with the ending, but it keeps cropping up in my thoughts. Decelerate Blue is a science fiction tale set in a not-too-distant future where speeding up to keep up with societal and technological change is not just necessary, it's the law. Angela, a teenage girl, does not quite fit in here, and she resists many of the required "hyper" requirements, such as reading special novels, watching special movies, and going to a special mall. People even speak in rapid style, ending each speaking turn with a marker "Go." (This last feature was pretty maddening for me to read at the start of this book, but I eventually got used to it.) In this future, trying to slow life down is an act of resistance. Angela's actions lead to some attention, unwelcome from some (like her parents) and welcome from others (like the mysterious person who drops her a copy of Kick the Boot, a novel that becomes the manifesto for an underground movement). Soon, she literally drops out of society, joins the resistance, and finds a potential romance in an unlikely place. Still, the establishment is very well organized and relentless, and things do not go well for the resistors in the end. I am not going to spoil it, but the ending was pretty bleak and left me with small feelings of hope and large feelings of despair. Still, it is a very affecting book, and that it stirred such emotions up in me is the hallmark of something done right. I have to say that the combination of artwork and narrative is pitch perfect for this sort of tale, though I was largely dissatisfied with some of the character work. 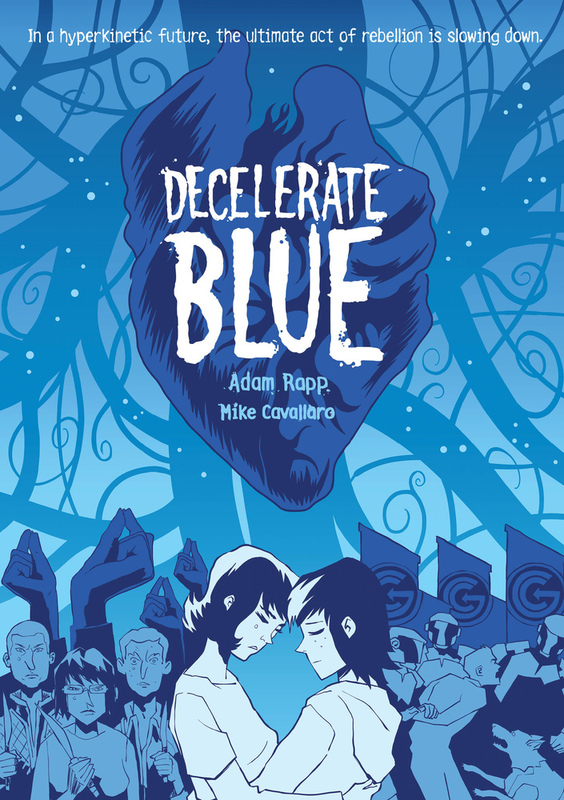 This book is a collaboration between writer Adam Rapp and artist Mike Cavallaro. Rapp is a Renaissance man who has worked on movies, music, novels, and play writing, and he was nominated for a Pulitzer Prize in 2006. Cavallaro has worked in comics for a couple of decades now, with a number of graphic novels to his credit, including Foiled, Curses! Foiled Again, The Life and Times of Savior 28, and Parade (with fireworks). All of the reviews I have read for this book have been glowing. 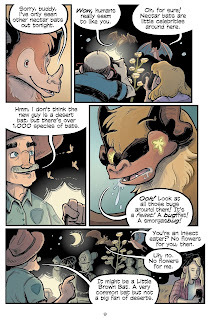 Kirkus Reviews summed up, "This is a strikingly illustrated book set in a potentially massive world, and readers will hope this isn't the only story to come from it." In a starred review from the School Library Journal Jordeana Kruse gave this verdict, "Fans of George Orwell’s 1984 and Ray Bradbury’s Fahrenheit 451 will find much to ponder in this notable graphic novel." April Spisak wrote that even though it is not happy "the conclusion remains complex and poignant." 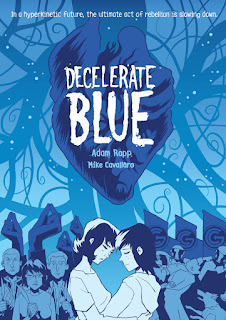 Decelerate Blue was published by First Second, and they have a preview and much more available here. There are some language and sexual situations that might not play well with younger readers, but I think that this book would be appropriate for older adolescents. The second book in a trilogy can feel padded out, like the author is laying the groundwork for the grand conclusion but still holding back on the "good stuff." I am happy to say that the second book of March does not fall into that trap, and I daresay it is even better than Book One. The framing sequence of Obama's 2009 Inauguration remains a constant, but the past events depicted left me breathless and astounded. This book is a highly informative piece of nonfiction in terms of facts as well as emotions. 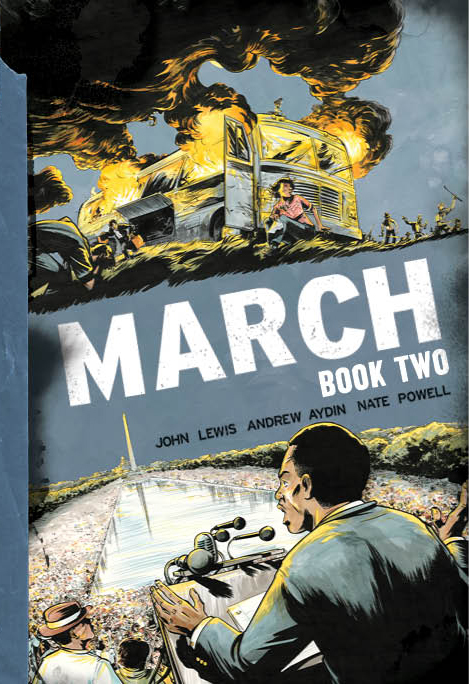 So much is chronicled in this book, from the Freedom Riders to multiple sit-ins and protests in Nashville and Birmingham, to the March on Washington where co-author Congressman John Lewis was a prominent speaker and MLK delivered his "I Have a Dream" speech. And most impressively, the many people and events packed into this book are all briefly and deftly identified, which was no small feat to accomplish. What sits with me the most after reading this book is just how much brutality and hatred Lewis and his stalwarts had to deal with. This book does not hold back in its depictions of those who opposed the civil rights movement, and their actions rightly are cast in terrible light. And although it does not cast its heroes solely in the glowing light of the entirely innocent, it does show just how much patience and perseverance they needed. It also shows just how much pain and misery they had to go through in terms of beatings and imprisonment. Certainly, the stories and travails portrayed here are essential reading for any informed US citizen. I know I am behind, and I will likely have to wait some right now, but I am eager to read Book Three. Lewis and his staffer Andrew Aydin penned the narrative for this book, and it was illustrated by Nate Powell, a veteran and expert creator with a long list of praised works, including the graphic novels The Silence of Our Friends, Swallow Me Whole, and Any Empire. 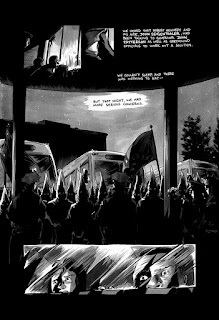 As you can see from the excepts, Powell's artwork is dynamic and energetic, and he makes excellent tonal use of black and white to tell riveting, moving, and powerful tales, even when people are simply speaking. You can watch all three creators talk about this book in this interview. This book won an Eisner Award and has been lauded by many. 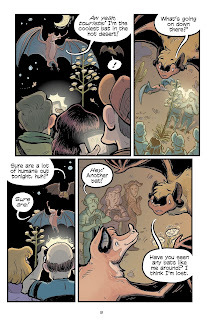 Etelka Lehoczky wrote, "Speeches and meetings might seem like dull stuff for a comic book — or, at least, like the dull parts of a comic book — but award-winning artist Nate Powell doesn't let that happen." Michael Cavna called it "a must-read monument." Publishers Weekly gave it a starred review and remarked, "Lewis, Aydin, and Powell’s combined experiences combine to recreate scenes of incredible feeling." March: Book Two was published by Top Shelf, and they have a preview and much more available here. Book Three recently won the National Book Award for Young People's Literature. Strange Fruit: Uncelebrated Narratives from Black History does exactly what its title says. I was shamefully unfamiliar with most of the stories recounted in this volume, even that of the Noyes Academy. I single that one out because it was located in Canaan, NH, and it's a small town where I used to teach summer school. I had no idea that once a landmark school was located there. There are many other stories told here in a straight-forward, semi-humorous fashion. These stories feature much courage and strength in the face of injustice, heartbreak, and misery. Some of these stories are about collective people, such as the shameful, racially motivated eviction of an entire community from Malaga Island. Most though are about exceptional individuals. 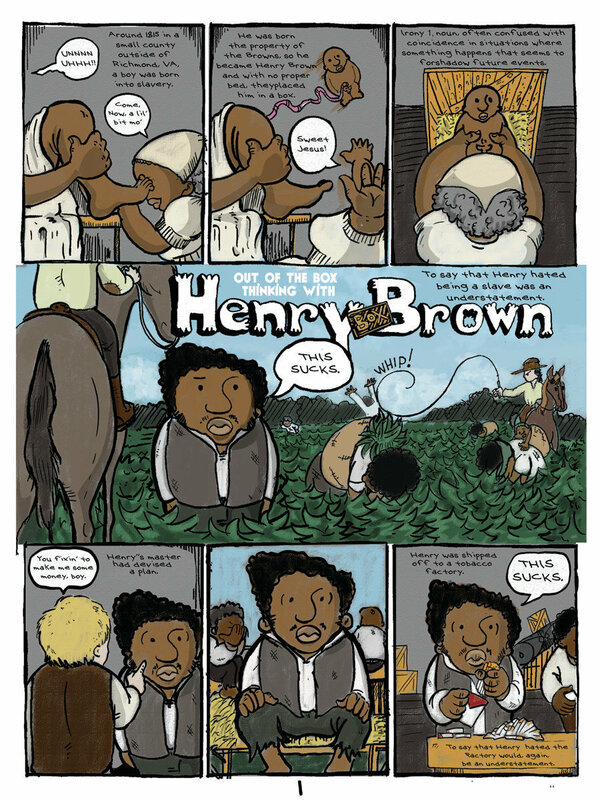 There is the tale of Henry "Box" Brown who was literally mailed north to freedom. Also, many forgotten figures are celebrated, like Bass Reeves, the most successful US Deputy Marshal; chess master Theophilus Thompson; magician Richard Potter, and bicycle champion Marshall Taylor aka "The Black Cyclone." Like I noted above, there is an undercurrent of humor running through these sometimes difficult stories. 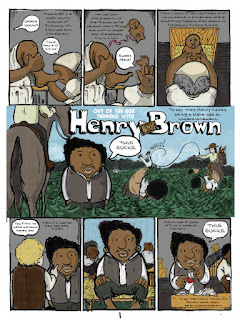 One recurring funny feature is the flying baby birth, as seen in the "Box" Brown excerpt. Many of these tales start that way, and there are small jokes and asides from time to time. 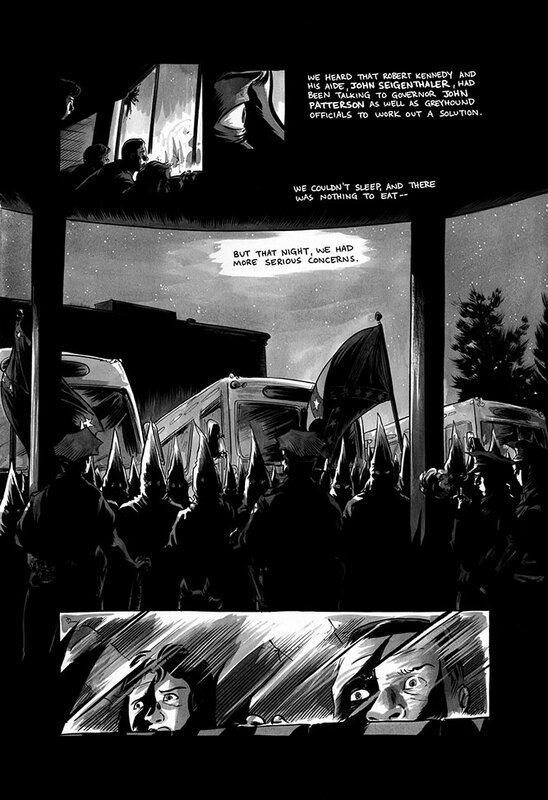 There is also the visual motif of the crow, which delineates the presence of Jim Crow enforcers and ways of thinking. Racial slurs are similarly represented pictorially, to good effect. These are stories directed toward a younger audience, but it does not hold back on showing the difficulties and hatred folks had to endure, as well as the will power needed to persevere through such conditions. The artwork might seem too simple for some, but I think it is very expressive. Another critique I have seen from multiple sources that I agree with is that this book is very male-centered and also not so delicate about depicting Native Americans. This book's creator Joel Christian Gill is the the Chair of Foundations at the New Hampshire Institute of Art. Since publishing this book, he has embarked on creating and publishing extended biographies of African-Americans in his Tales of the Talented Tenth series. Thus far he has two volumes, on Bass Reeves and Bessie Stringfield, and he is working on at least a couple more. He speaks about his work on Strange Fruit in this interview. All of the reviews I have read about this book have been positive. Rob McMonigal called it "a wonderful addition to non-fiction comics." Allyce Amidon called it " visually witty, engaging, and well researched." And Megan Purdy called it "a great book that deserves to be read, discussed, shared and celebrated." 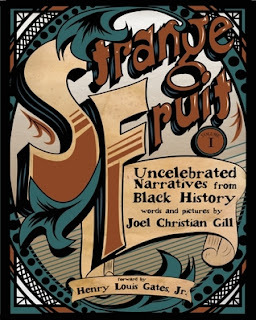 Strange Fruit was published by Fulcrum Publishing, and they have an excerpt and more available here.